In petition of decision to release soldier to open base, prosecutor claims to have more evidence against him. 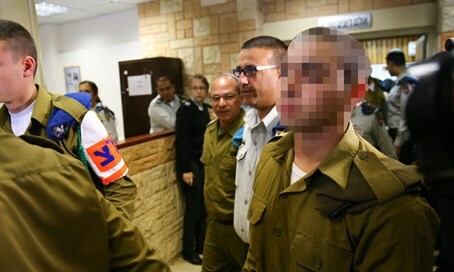 The petition court on Friday morning began hearing the military prosecutor's petition against Judge Lt. Col. Ronen Shor's decision the night before, when he ordered to release the soldier who shot a wounded terrorist in Hevron last week from jail to an open base. That release was postponed and the soldier was left in jail overnight, so as to allow the prosecution to petition. In Thursday's hearing, the prosecutor had dropped the murder charges against the soldier, instead accusing him of manslaughter. Attorney Sharon Zagagi Pinchas, the chief prosecutor, said at the start of the petition hearing Friday that "it is impossible to accept the claim of the respondent according to which he acted out of life-threatening danger or operational needs; rather it is clear that the shooting of the terrorist was intentional shooting." "The soldier decided to conduct the shooting without operational needs, all while the terrorist was neutralized - and was still alive," she added. While the military court has ruled that there is "evidence going both ways," the chief prosecutor claimed she has a picture with evidence that the soldier breached the law by shooting the terrorist - who minutes earlier with an accomplice stabbed and wounded a soldier. Pinchas said that Judge Shor refused to view the video filmed by an Arab activist of the radical leftist NGO B'Tselem, which she claimed proves the development of the incident even while the defense attorneys argue it was edited and tampered with. She said the prosecution has two pieces of testimony from soldiers which strengthens the evidence against the soldier. In the hearing on Thursday, when Shor rejected the prosecution's request to extend the soldier's arrest by seven days and instead ordered his release to open detention, the prosecution admitted that it still needs to investigate the B'Tselem video evidence. During the hearing an officer in the army's Criminal Investigations Department (CID) backed the soldier's version of events by confirming there were concerns the Arab terrorist had a bomb belt hid on his body at the time the soldier shot him. The soldier has argued he shot the terrorist over concerns he was moving to detonate a bomb belt that was thought to be hidden under his unseasonably thick coat. That version of events was also vindicated by a Magen David Adom (MDA) investigative committee.